Once again, we are grateful to Rich Sokerka (Editor), Cecile San Agustin (Reporter) and everyone at The Beacon -- the award-winning newspaper of the Roman Catholic Diocese of Paterson, NJ -- for their excellent coverage of the Passaic Neighborhood Center for Women. Highlighting the importance of the diocese's "Partners in Faith" campaign to the Center, the article in this week's Beacon is one of many that has helped us to publicize just how much this ministry is needed in this neighborhood. Click here to read this week's edition (see especially page 3). 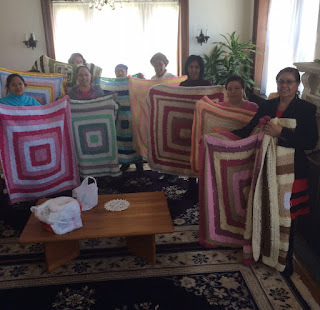 As our faithful blog readers and benefactors know, our women have been learning how to crochet since September 2015. The photo above attests to the progress they have made in crocheting during the past seven months -- from washcloths to scarves to afghans! Now, they are asking for your help. We are in need of funds to buy new yarn for the crocheters' ongoing projects. Certainly, we will continue to use the leftover or unused skeins that you have already given us from your closets at home. These can be used when the women learn a new skill or want to make something small. However, we are working toward teaching them how to sell their crocheted items online. In order to do this, they must have items to sell. In order to have items to sell, we must buy the yarn they need to do an entire project. So, what exactly are we asking? Would you be willing to donate money, Visa gift cards or gift cards for Hobby Lobby, A.C. Moore or Michaels to be used to buy the yarn our women need for their larger projects? An easy way to donate money is to use the "Donate" button on the blog -- accessible by clicking here. To donate cards, please call Sr. Ann Marie, Director of the Passaic Neighborhood Center for Women, at (973) 470-0844 or email her at sam@patersondiocese.org to arrange for drop off or pick up. This would be a nice project for your parish group, women's or men's group, mission club, school or other organization. By donating to this cause, you are clearly assisting in the mission of the Center, helping to preserve the dignity of our women and strengthening their families. Volunteer Week: What About You? In his homily at the Mass at the Cathedral Basilica of Saints Peter and Paul in Philadelphia last September, Pope Francis recounted the story of Katharine Drexel's meeting with Pope Leo XIII in 1887. You might recall the story: When Katharine Drexel described the needs of African Americans and Native Americans to the Holy Father, suggesting that missionaries be sent to the West and Southwest United States, his answer was, "What about you? What are you going to do? Why not become a missionary yourself?" Katharine Drexel went on to found the Sisters of the Blessed Sacrament, who exist to this day to serve Black and Native Americans. During the past week, this blog has been recounting stories of the volunteers at the Passaic Neighborhood Center for Women. As we continue to grow and our mission takes hold, we are in greater need of volunteer help. If you have the time to offer even one or two hours each week to teach English, babysit children, teach crocheting or basic sewing, or to offer another service, consider this your invitation to contact us. The growth of this ministry depends on so many more taking this question to heart and contacting us to help. If you (or someone you know) would like to help, please contact the Center at (973) 470-0844 or email Sister Ann Marie at sam@patersondiocese.org. To our current volunteers, we say, "Thank you." To our future, as yet unknown volunteers, we ask, "What about you?" Our Wednesdays are filled with English, English and more English! Throughout the day, our women can be found working on Rosetta Stone. From 10 to noon, Marie Mead teaches her ever-growing English class . . .
. . . And from 1 to 2 pm, Ann Marie Peterson teaches hers . . .
. . . As you can see, many different methods are used -- texts, newspapers, computers, and old-fashioned face-to-face conversations. Our volunteers are making such a difference. We are grateful! What would a week of celebration be without food? We do not know, as we have food in abundance this week to celebrate our volunteers! Because our women are great cooks, the celebrations at the Passaic Neighborhood Center for Women are always graced with good food. We had tamales, taquitos, pan dulce (or pan de Mexico), arroz con frijoles rojos, and many more delicacies. See the photos below for more information -- and THANK YOU, volunteers! As we continue to travel through National Volunteer Week 2016, we are delighted to show you photos of our "Tuesday crew." We are ever so grateful to them for their hard work and dedication to the Passaic Neighborhood Center for Women. Truly, we cannot do this work of God without our volunteers! publication that enhances our program. is familiar from her experiences and contacts as a teacher. and at various other places throughout New Jersey for many years. Here she instructs the women as they begin a new project. 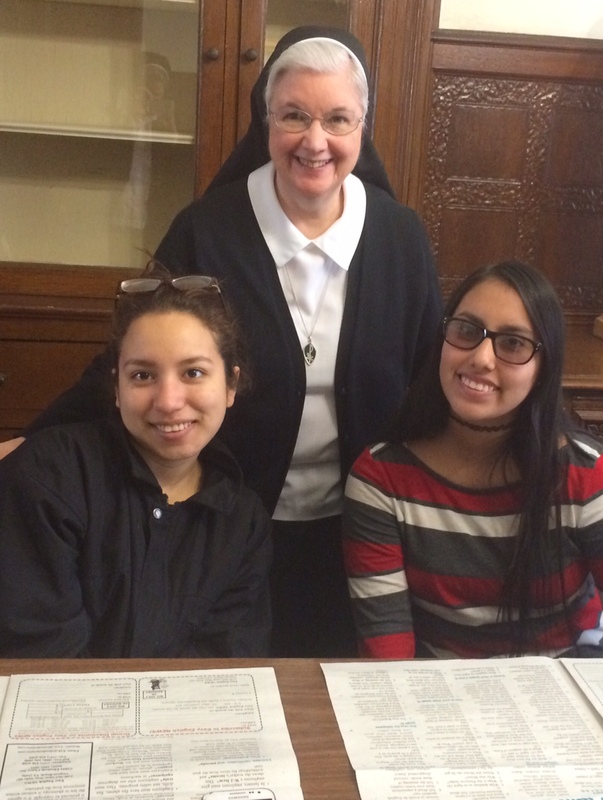 As we enter into National Volunteer Week, we express our gratitude to Sister Eleanor, SMIC and Sister Margaret, SMIC. On most Mondays, you'll find Sister Eleanor teaching English and Sister Margaret watching over the children whose mothers are learning English. To these Sisters and to all volunteers who serve the Passaic Neighborhood Center for Women, we say THANK YOU! Sister Eleanor, Sister Margaret and some of our women share a Monday morning treat during National Volunteer Week. Sister Eleanor's class is learning poetry. At the time this picture was taken, Sister Eleanor was introducing "Trees," by Joyce Kilmer. Marie has been teaching this English class for over two years. There have been times when the class has consisted of one, two or three women. Sometimes in the past, we wondered if anyone would come. However, over the years there has been a steady increase in attendance. On Wednesday, eleven women -- count them, 11! -- attended the class! Not only are they learning to speak English well, but they are developing lasting relationships with each other and with their teacher. We really love showing these photos and telling these stories because they illustrate the ongoing fulfillment of the mission of the Passaic Neighborhood Center for Women -- to provide a peaceful, safe environment for women to meet each other and express their needs. We are so grateful to our faithful benefactors who make each day of this ministry possible.